Traveling through the Hill Country took us to Johnson City, Texas. 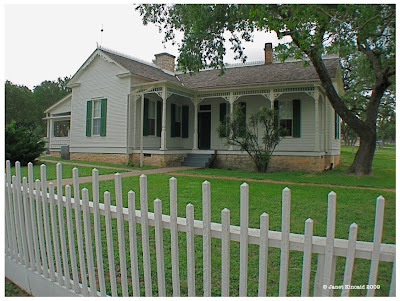 This bucolic town is the location of President Lyndon B. Johnson's boyhood home. It's now a national historic park maintained by the U.S. Park Service, along with his ranch a few miles out of town. We stopped in for a quick look and a tour led by park ranger Lou. LBJ Confidential. That could have been scary. Cozy cottage!